Concertino in D in the Style of Mozart (Violin and Piano). Composed by Hans M. Millies. For Violin, Piano Accompaniment. Music Sales America. 20th Century, Classical. 16 pages. Bosworth & Co. #BOE003591. Published by Bosworth & Co. (HL.14021464).ISBN 1846092531. 20th Century, Classical. 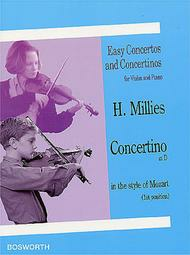 9x12 inches.Hans M. Millies' Concertino in D in the Style of Mozart covers the 1st position only.